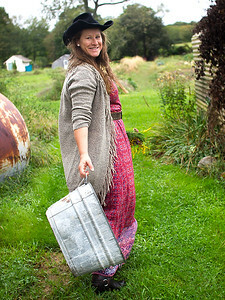 Meredith Brower, photographer and eco-artist, is owner/operator of Meredith Brower Photography, Firefly Mandalas and founder/director of the Firefly Yoga Festival. A graduate of the Rochester Institute of Technology with a Bachelor of Fine Arts in Commercial Photography. Brower describes herself as someone who "usually plays it safe". But when her own circumstances led her to a place of deep introspection, she knew it was time to take the risk and let her photography light shine. Like a firefly, she felt the light growing stronger the more she envisioned herself creating great imagery and making connections with her community. By letting her "inner fire fly", meredith has since created a 2017 yoga calendar, recently completed the 3rd Annual Firefly Yoga & Wellness Festival, created a barn studio in Tiverton, RI, and has launched a series of Firefly Mandala Note Cards & Gift line. Meredith's work is inspired by the quiet countryside and beautiful light in Tiverton, RI, where she grew up and gratefully lives today with her mom, dog Blackjack and kitty Babushka.